I live in the town of San Pedro, which is part of the city of Los Angeles, and is home to thousands of Croatians, including my butcher. For years, I have seen these little cigar-like Balkan Sausages at the butcher shop but unfortunately never bothered to ask about them. The other day, the lady in front of me bought loads of them. 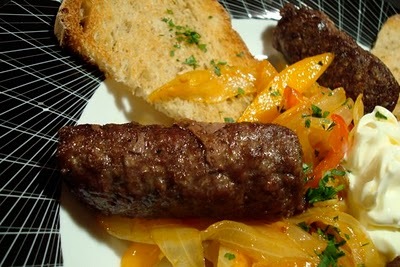 She said her family is wild about cevapcici and she usually grills or broils them and serves with onions and peppers in olive oil. So…I added some to my order. It was time to give these little guys a try. After some research on the Internet, I found they are almost always served with onions then ingredients like sour cream, peppers, paprika, and flat bread are not far behind. I sautéed onions and peppers then added salt, garlic and spicy paprika, meanwhile cooking the cevapcici under the broiler. I even found a video on how to make them, although I couldn’t understand a word except “cevapcici,” I did see how they are formed, by a unique kitchen gadget, into what I would call a particularly unfortunate shape as they are not too pretty for the camera if you know what I mean. But, boy, are they ever delicious! My butcher instructs me to pronounce all the c’s like a ch, so I sound like a Croat. He makes his with lamb and beef and spices although some also add pork to the mix. Lydia Bastianich and Mike Grgich. I plan to serve a lot of cevapcici this summer (now that I can pronounce it), hot off the barbecue grill, maybe with a yogurt cucumber dip? If you’re in the neighborhood, stop by and give them a try. 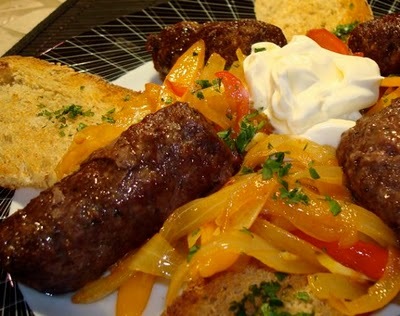 An interesting reading and revelation of a new recipe.Thanks for sharing it and for the corrrect pronouciation of Cevapcici as Che-Vap’-Chi-Chi. I missed so much for the last few weeks Loru Lynn..your wild salmon, your sandwiches, all your spring photos…nice to get back into it. I’m seeing so much food, that my hunger is non-stop here in front of the screen. These sausages especially…they look wonderful and you idea of a cucmber dip sounds perfect. it’s fun to say! and looks fun to eat. i love the combination of onions, peppers and sour cream! Hi Anamika – I had to practice saying it several times. Now it’s rolling off my tongue. Hi Ronell – looking forward to seeing what you’ve been cooking! Hi Pink – Fun is a good word for this dish. I look forward to grilling them for my little nephews and teaching them how to say it. I am sitting here alone trying to say this. Hope no one is hearing me! This dish looks great and we are big fans of sausages, especially with the onions! You have stumbled upon something good here sista! Hi Winedeb – haha -you can hear him pronounce it clearly at the end of the video. It’s a tongue twister. Sista Maryann – cracking me up again. These little “unfortunately-shaped” sausages are going to be showing up at many of my parties. Hi Lori lynn. Thank you for stopping by my blog the other day. What a pleasant surprise to find this post as it holds many fond memories for me. I worked for 2 summers in Slovenia and Cevapcici were a standard on the grill all summer. In Slovenia the avjar was always present also, kind of a Salvic ketchup. Avjar is a mild roasted red pepper paste. It’s delicious and I wish I had some to grill right now. You make me want to head to LA right now! Hi Marla – I just bought a jar of AVJAR at the meat shop. YAY! Can’t wait to try it! Hi Anon – nice to hear from you! It is South Shores Meat Shop on Western at 25th Street. Hi Cynthia – oh please come by! I had no problems with the pronounciation :). They seem to be a great mixture, although I’ve never heard about them. Cevap was my favorite childhood food, especially if you put it in homemade flat pita bread, with onions in …yummmm! Hi Sandra – our town, San Pedro, has a Croatian heritage, so around here, everyone even knows how to pronounce them! I forgot to add that you do not have to mix meat..I am using plane beef for these, and mixing ingredients by myself…but you did wonderful, they look really amazing!